Henry Sinclair lived from about 1345 to 1400. He is known primarily for (possibly) being the man who first discovered the New World, a century ahead of Christopher Columbus. The wider picture in Scotland at the time is set out in our Historical Timeline. At the age of 13 in 1358, Henry Sinclair inherited from his father the titles of Baron of Roslin, Lord Chief Justice of Scotland and Admiral of the Seas. 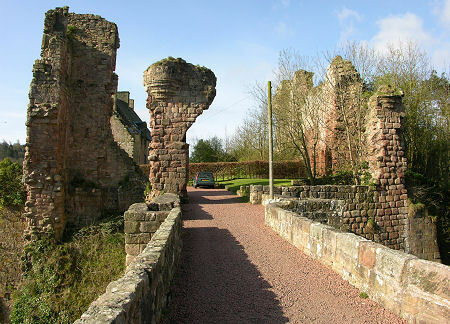 The family seat was at Rosslyn Castle south of Edinburgh close to the site of Rosslyn Chapel, built by his grandson. Meanwhile King Håkon of Norway was having a difficult time resolving the question of succession for the title of Jarl of Orkney. The obvious male lines of succession had died out, and the only available maternal line ran to Henry Sinclair, who as a result was invested as 1st Earl of Orkney by King Håkon on 2 August 1379. In return, Håkon expected Sinclair to pacify Orkney and Shetland, which had become increasingly disordered during the period without a Jarl, or Earl. Sinclair built Kirkwall Castle to serve as a base from which he could exercise control over the Northern Isles. By 1390 Sinclair had Orkney under firm control and set out with a fleet of 13 warships to, in effect, reconquer Shetland for King Håkon from the Norse warlords who had taken control. Sinclair was successful in bringing Shetland back under the control of the Norwegian Crown. The story so far is relatively uncontroversial. Take a deep breath, because from here on it is anything but... While in Shetland, Sinclair is believed to have rescued two Venetian brothers, Nicolo & Antonio Zeno, whose ship had run aground and who were under threat from the islanders. In return the brothers undertook to put their undoubted seafaring skills at Sinclair's disposal. Meantime, a fisherman turned up in Orkney who had been missing for twenty years. He told a remarkable story of having been driven far west by storms and reaching a temperate land peopled by strange natives. Greenland was already known and, indeed, had been claimed by Norway since 1261, and the fisherman's stories suggested that there was somewhere beyond. Sinclair was determined to find out what lay behind these stories, and some time in the late 1390s led an expedition west, accompanied by the Zeno brothers. Passing beyond Greenland, they landed in what could well be Newfoundland, before pressing on to "a fertile land, mild and pleasant beyond description". Sinclair returned to Orkney in 1399, telling stories of the land he had found and making plans to return on a more organised scale. It was not to be: he died fighting English raiders in Orkney in 1400. It would be fair to say that this story is far from universally accepted. The main documentary evidence comes from letters supposedly written between the Zeno brothers in around 1400, which some regard as forgeries from the 1500s. Even if the letters are genuine, the story hangs on the man they refer to throughout as Zichmni being Henry Sinclair. There are also geographic problems with the letters: they refer to islands off the east coast of Iceland that do not exist, and there are other discrepancies. On the other hand, the Micmac tribe of Nova Scotia tell a traditional story about a king who had three daughters who travelled from an island far across the sea with many soldiers, stayed for a year and left again: a story that fits exactly with the Zeno brothers' account of events. 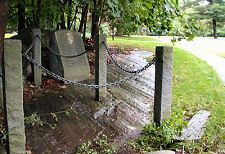 There is also, at Westford in Massachusetts, a rock with a strange design on it. In the right light, this can look like the outline of an armoured knight, complete with a shield bearing the crest of the Clann Gunn. This is claimed to be the memorial to Sir James Gunn, presumably lost on the expedition during an effort to explore the interior of the New World. The modern stone nearby reads: "Prince Henry First Sinclair of Orkney Born in Scotland made a voyage of discovery to North America in 1398. After wintering in Nova Scotia, he sailed to Massachusetts and on an inland expedition in 1399 to Prospect Hill to view the surrounding countryside, one of the party died. The punch-hole armorial effigy, which adorns this ledge is a memorial to this knight." 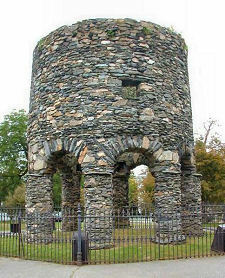 Supporters of this theory point also to the presence of Newport Tower in Rhode Island, a stone structure of indeterminate but clearly pretty considerable age. They also note that in 1849 a cannon of Venetian design allegedly dating back to the late 1300s was dredged from the harbour of Louisberg on Cape Breton Island: exactly the sort of cannon that would have been carried on their ship by the Zeno brothers and salvaged by Sinclair from the wreck as highly valuable. Non-believers will tell you that the "Westport Knight" is an image formed largely from natural weathering of the rock, with some superimposed carving from the 1800s; and that the Newport Tower was originally a mill dating back to the 1600s.